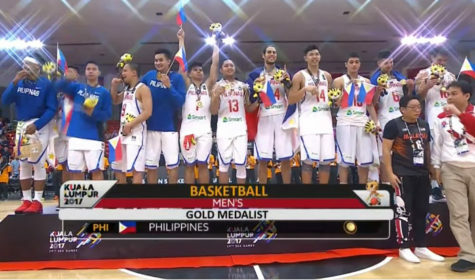 Gilas Pilipinas won all games in the Southeast Asian games to win the 17th Gold of the Philippines in the event. The Gilas finished the preliminary round and win 3-0 record and defeat the Singapore 68-60 in semi finals and also won the gold match against the Indonesia 94-55 yesterday. In their games against the Indonesia Mike Tolomina led the game with 20 points 4 rebounds and 3 assists, Kobe Paras added 4 points while Bobby Ray Parks had 2points, 5 assists, and 12 rebounds. Scores: Philippines 94 – Tolomia 20, Paras 14, Jose 12, Standhardinger 11, Rosario 8, Ravena 7, Ferrer 5, Pessumal 5, Amer 4, Parks 2, Vosotros 0.